415 Westmoreland no longer exists. 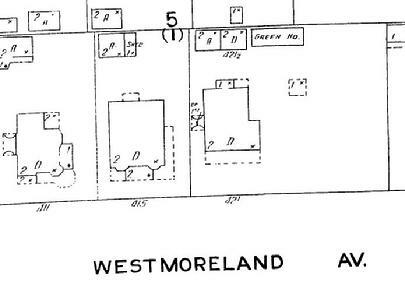 Townhomes are now in its old location on lot 15, Block 5 of the original subdivision. Between about 1906-1910, the home was occupied by William T Eldridge and his family. Eldridge had moved to Houston in July 1906. Eldridge had a very tumultuos few years before he moved to Houston and was responsible for two homicides and had survived two attempts on his own life. He was involved in the development of Sugar Land and in 1910 moved to Sugar Land, selling the house to Lester Thompson Hubbell and his wife, Julia. Lester Hubbell was a well regarded businessman in the Cotton industry, and unfortunately, in 1911 soon after his move into 415, he died at home, leaving Julia a widow. Julia kept the home and lived there with her daughter and son in law for the next several decades. She took in boarders, including several noteworthy individuals in their own right. A longtime boarder was Edith Wright, who served as the principal of the Hawthorne School, which was located at 1417 Houston Avenue. Another one time boarder was Genevieve Johnson, who served as dean of students of the South End Junior High School and then San Jacinto High School, when the Junior High was converted. The school building lived on as part of the HCC campus. One other notable boarder was Dr. Elva Wright, who was a pioneer in the role of women in the medical profession and in the treatment of tuberculosis.